What better way to get acquainted with the world of steampunk than with our steampunk statues! 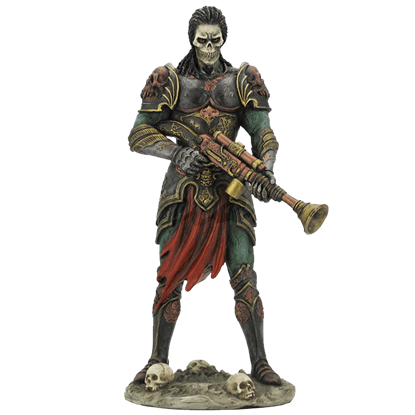 Our steampunk statues showcase the denizens of steampunk fantasy and sci-fi realms, so you will find a wide variety of characters and structures residing here. Check out steampunk fairy statues, steampunk angel statues, and steampunk dragon statues for a fresh, Neo Victorian take on traditional fantasy. We also offer a variety of steampunk skeleton statues and steampunk skull heads that reveal the darker side of some steampunk timelines. 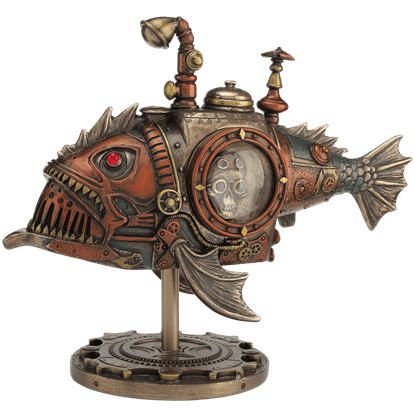 You will also find a wide range of steampunk statues based on other strange creatures and ingenious devices, such as our steampunk unicorn busts, steampunk submarines statues, and even hanging steampunk airship statues. If you can imagine it in steam style, you may very well find it here in our steampunk statue category. Prepared for whatever situation she encounters, this bold fairy stands with a steampunk gun in her hands. 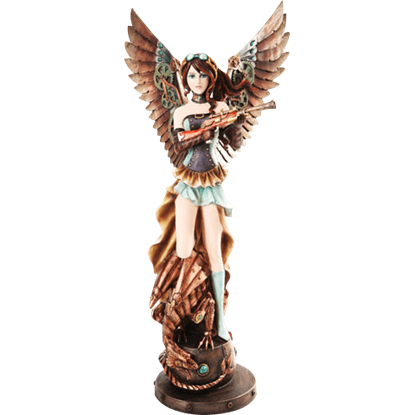 The Armed Steampunk Dragon Angel Statue also displays her dragon companion crouching at her feet on their pedestal. Prepare for the battle of the future with the bone chilling Armored Steampunk Skeleton Statue. This daring figurine can add new levels to your current collection of steampunk decor with full armor and a menacing stance. The human skull is a wondrous thing, housing the organ that in turn houses our souls. This curious bone is made only more wondrous when given neo-Victorian modifications, like the one depicted by the Articulated Steampunk Skull. 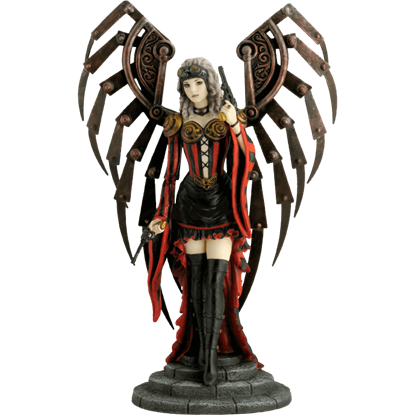 With a great blend of steampunk and fantasy the Avenging Angel Statue brings these two worlds together with a bang. Crafted from polystone, this fairy gives a great twist on dark fantasy and steampunk alike. Designed for ocean exploration, this Black Seadevil Steampunk Submarine resembles an anglerfish who dwells in the deepsea areas where no sunlight can reach. Instead of a bioluminescent lure, this submarine has a steam-powered lamp. 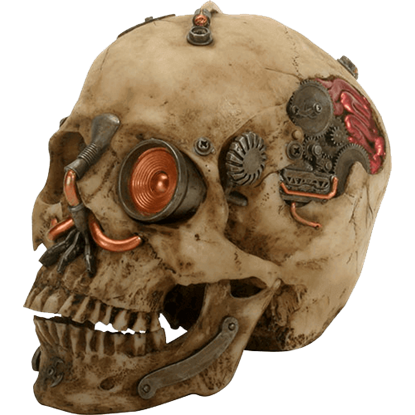 Mechanical-inspired embellishments transform this human skull into a robotic monstrosity. 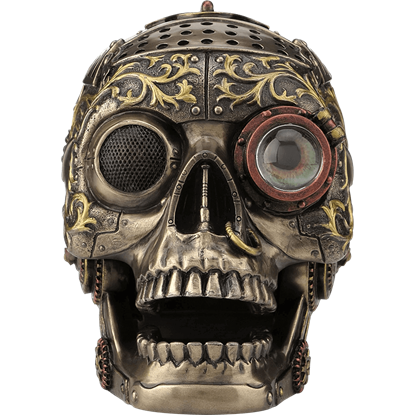 Made of high quality cold cast resin, the Bright Metallic Machine Skull displays a golden colored macabre twist on typical steampunk style. Wings open from his recent landing, this masked warrior brandishes his gun as he surveys his new location. 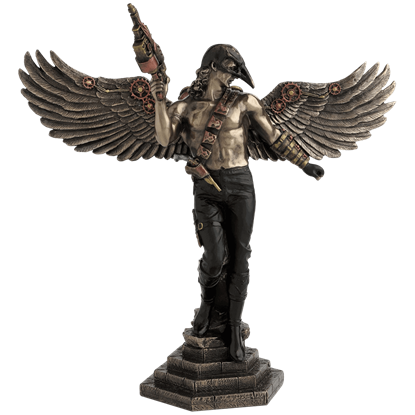 Display this Bronze Crow-Masked Winged Steampunk Warrior on a shelf or table for an elegant fantasy vigilante display. This lovely fairy is all done up to attend a masquerade ball. 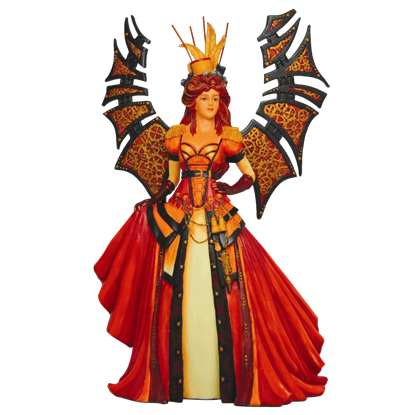 Her costume of choice is one that will shock and awe her companions, as this Colorful Steampunk Faery Statue has a style that most faeries have never seen before. Hand painted the color of ancient bone, this skull shows curious mechanical details. 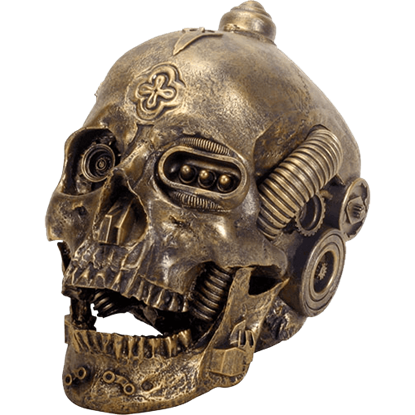 Made entirely of high quality cold cast resin, the Copper Detail Cyborg Skull is an intriguing and macabre display of twisted steampunk style. An elegant warrior from another time, this stylish figure wears mechanical feathered wings that open with gears and levers. 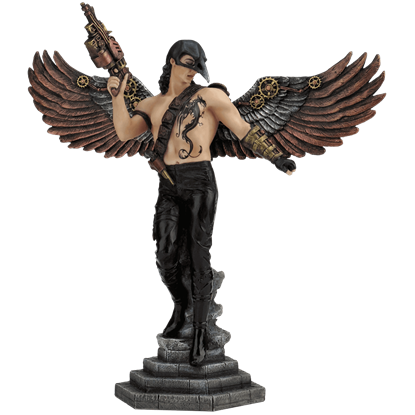 Display your Crow-Masked Winged Steampunk Warrior Statue with any Neo-Victorian or fantasy vigilante display. Steampunk is a branch of science fiction that relies heavily on steam powered machines rather than advanced technology. 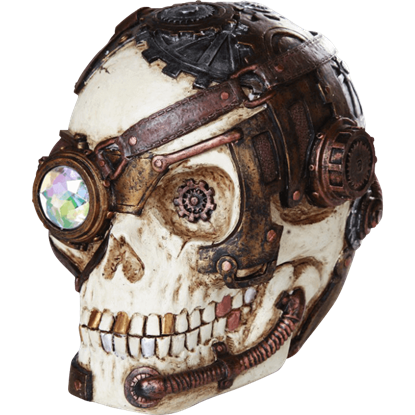 With that in mind, it is easy to believe the Crystal Eyed Steampunk Skull is the remains of a steampunk cyborg. What makes a steampunk world so wondrous, so amazing, so enticing? It is the unknown, the ability to see things like you have never seen before. 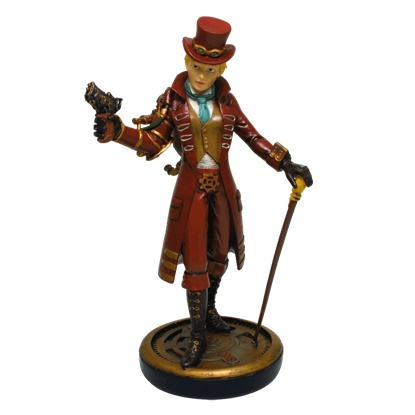 You can make a part of that world yours by owning this Dapper Steampunk Lady Statue. I am impressed with the communication with this seller. They responded to my inquiries quickly and thoroughly. Fast shipping and high quality item (DK1059-3). A very smooth transaction.